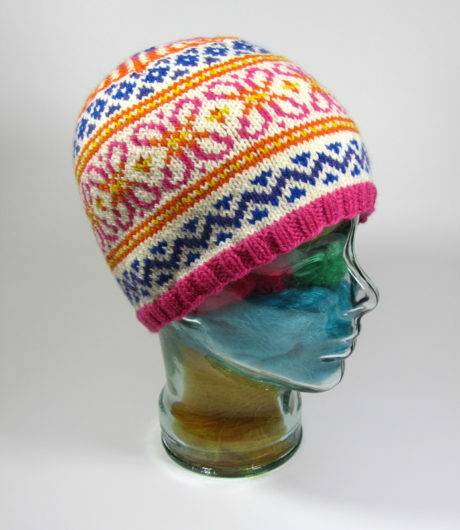 This is a severely hacked “Scrappy Ski Hat.” It’s a great little free pattern by Justyna Lorkowska. If you’re just returning from that link you are probably scratching your head as you ponder how different my version is. My Scrappy is knit in two partial skeins of Shepherd’s Wool Worsted, by Stonehedge Fiber Mills. The shades are Antique Rose and Spruce. The pattern calls for changing the colors after just one pattern repeat. The thought of weaving in all those ends felt daunting, so I decided on a two-color version. And that pompom is made with the largest sized Clover Pom-Pom Maker. Such a clever little tool. If you have one and haven’t been able to make much sense of the rather compact directions on the packaging, this is Susan B. Anderson’s great video on its operation. 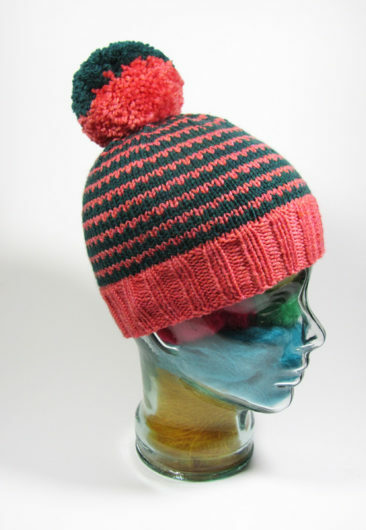 I feel like the extravagant pom-pom really makes this hat. 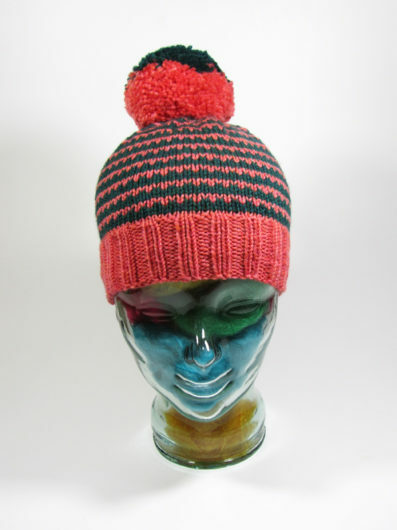 This next hat is Joan Sheridan’s “Freedom Cap.” It’s also knit in Shepherd’s Wool Worsted. I’ve knit this before. Recently, I was at Joan’s great shop, Heritage Spinning & Weaving in Lake Orion, Michigan. I just couldn’t pass up the chance to buy an additional kit and knit this one again. Not every knit a knitter tackles turns out wonderfully well. I’ll save what’s off about this next one to the “reveal” at the end. 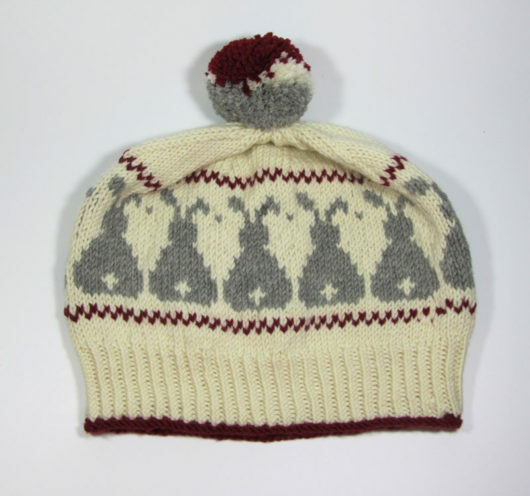 This is Hanna Maciejewska’s great free pattern: Snow Bunnies. Let’s start at the crown this time. My Snow Bunnies is knit in Plymouth Yarns Worsted Merino Superwash. That pom-pom isn’t hiding an icky crown decrease. The crown is quite nice. It’s a slouch hat and the gathers are very appropriate. So, here’s a view of the snow bunnies. So cute. Really. I like this hat, a lot. But I made a rookie mistake and didn’t check my gauge before knitting. I knit hats for all sizes of heads, so gauge usually doesn’t really matter much. And when hats come out rather large, both Steve and I have gigantic heads. So big hats fit us well. Every hat eventually gets its head. If you know an offensive tackle who wants to wear bunny butts and a fluffy pom-pom, let me know. Sometimes your knitting can give you some challenges. I wasn’t quite up to this one. I couldn’t just get with the program for the crown. More on that in a bit. 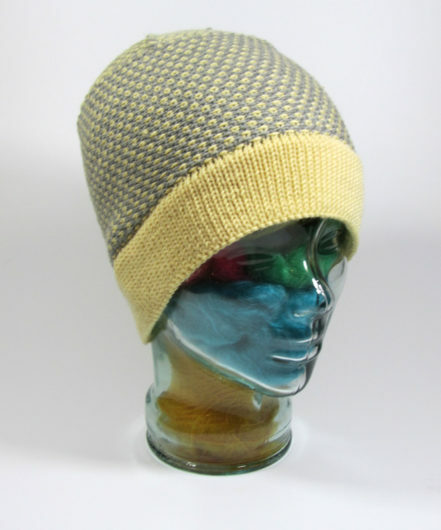 This is Black Brook Beanie, a new free pattern by Tammie Canavan-Soldaat. The hat is a glory of two-color linen-stitch. It’s slow going, but so so much worth the effort. My Black Brook is knit in Plymouth Yarns Worsted Merino Superwash. 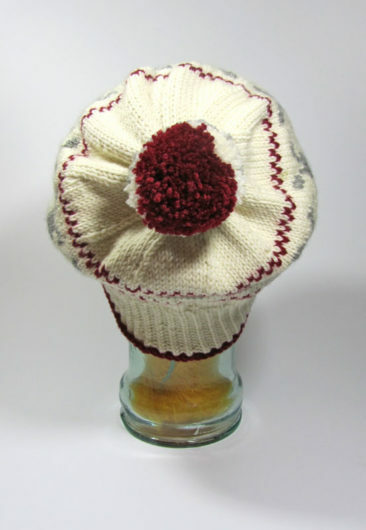 The pattern had one teeny hiccup in it, which the designer corrected–so if you downloaded it in its earliest days, be sure to download it again or read the errata on the Ravely pattern page. 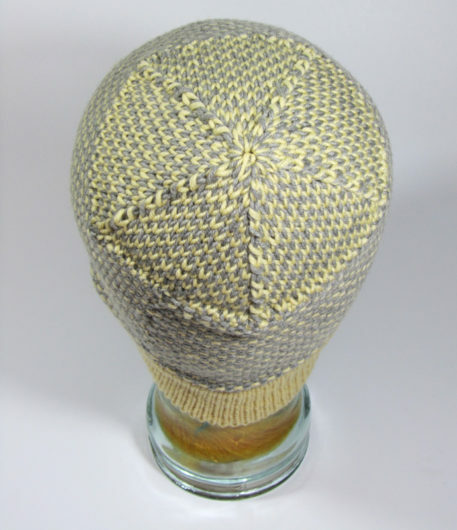 Despite the crown decreases being correctly written, a knitter needs to be able to read the knitting to keep the linen stitch colors properly lined up through the crown. I just wasn’t up to it. 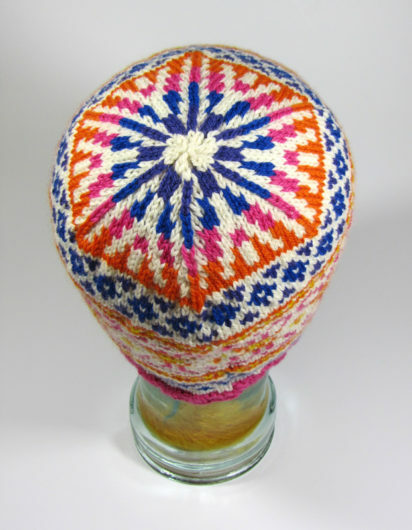 After a few tries, I gave up and just knit the entire crown in a salt and pepper “fair isle” pattern. It worked. It’s cute. But I have to call it my Black Brook Beanie Hack. Do give this pattern a try. In the original, it’s a beauty!